The 35th Ikaros International Chess Tournament 2012, Aegean Open Championship 2012, will take place on 7-15th July in Agios Kirykos, Ikaria island, Greece. 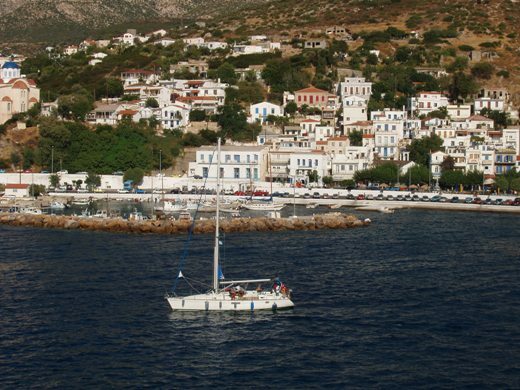 Why do people keep coming back to Ikaria every summer? Ikaria derives its name from Ikaros, the son of Deadalus, who according to Greek mythology, was the first man to fly but he flew too high and too close to the sun so that his lax wings melted and he was drown into the sea that, since then, was named after him. The island of Ikaria is located at the east part of the Aegean Sea, close to Samos. It’s also known by the name Nikaria or by its ancient name Doliche. In the ancient times Ikaria was famous for its wine (called “Pramnios Inos”) and its spas that nowadays are visited by thousands of people every year. In the years after WWII and the Greek civil war (1945-49), Ikaria was used as a place of exile for communists, and thus it acquired the nickname “The Red Rock” that still holds today. But apart from the spas, the wine and its communist past, Ikaria is also well known among Greek chess players for its annual chess event Ikaros International Chess Tournament, commenced in 1978, as a friendly tournament between local players and some stronger players from the rest of Greece. In the following years there was in increasing interest for the tournament and, in 1991, the organizers decided to turn it into an international chess festival with preliminary events taking place all around Greece during the winter, culminating in summer at Ikaria. The “Soul” (as well as the “Body” one could claim) of Ikaros Chess Festival is Mr. Kosmas Kefalos who, before, during and also after the festival, works overnight to have everything done! Since 1991 more than 14000 games have been played in Ikaria. Players from more that 40 federations and 4 continents have visited the island while all recent Greek champions have took part in the tournament. All these years the festival has acquired some permanent friends from Greece as well as from overseas that come to Ikaria every summer and again to take part in the festival. But what is this that makes these people return to Ikaria every summer? Is it the strong composition of the tournament and the high prizes or the luxurious hotels, the bars and the trendy beaches that one finds in tourist islands like Mykonos, Paros or Santorini? No, definitely not. There is, of course, a number of GMs and IMs playing in the tournament every year but the majority of the players are non-professionals who come to Ikaria with their friends and family to combine their vacations with a chess tournament. In this respect Ikaria is an ideal place for chess players in summer. 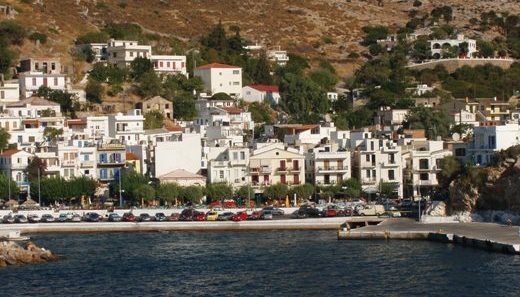 Agios Kirykos, the capital of the island, where the tournament is held, is a small town, so every morning and every evening all chess players meet at the cafes down at the port. You can chat, enjoy a cup of coffee, or just relax viewing the Ikarian Sea. The atmosphere is very relaxing and no one is in a hurry. This is a very distinct characteristic of Ikaria. There is no hurry for anything! This at first might appear strange or even annoying for the unfamiliar visitor but it only takes a couple of days to get accustomed to the local rhythm of life and start enjoying it! In fact this is exactly what people appreciate at Ikaria and return to it. In some cases you can even leave a café or a restaurant without paying. The waiter is in no hurry. You will return the next day and pay your debts! The atmosphere of the tournament is also very friendly but there are some dress code rules: Short trousers and a summer look is the order of the day (tuxedos are not accepted)! The tournament is held at the new, comfortable basketball stadium of Agios Kyrikos. In order to avoid any problems due to the summer heat, the games begin at 7.00 p.m. in the afternoon. Hmm… Isn’t it a bit late? Well, no! You see, nightlife at Ikaria begins after midnight so there is no need to hurry. If you visit the cafes or the local bars at 11.00 p.m. on a Saturday night you might think that no one is there. An hour later the place is full of life. Midnight is coffee time and then by 3.00 or 4.00 a.m. it’s time for the disco! And what is the time to go to bed? Well, how about sunrise or even later? Yes, but “I have to play a game the next day!”. Relax and enjoy! The next game is at 7.00 p.m. in the afternoon. You can get a good sleep, then go to the beach, eat a good lunch at the local tavernas and you are ready for the next game! In Ikaria, the local traditions are still alive and Ikarians are very proud of them. If you want to get a taste of these traditions you should visit one of the famous Ikarian “panigiria” (festivities) organized throughout summer in various places. At panigiria you can taste the local wine and dance the famous “Ikariotikos” till the morning (Yes, going to bed in the morning is an old tradition at Ikaria). But of course, for those who do not wish a wild nightlife, Ikaria is also a very nice place just to relax. There are some very nice beaches to visit (e.g., Gialiskari, Armenistis, Nas, Prioni, Messakti, Faros, Agios Georgios ust to name a few). You can also visit the town of Evdilos at the other part of the island or the villages of Faros and Rahes (where the stores are closed in the morning and open at night!). A good idea is to rent a car and go all the way from Agios Kirykos to Nas (at the other part of the island). You will have the chance to see many picturesque small villages up on the Atheras mountain and enjoy the view of the island from above. The more adventurous can try to visit Maganiti or Karkinagri. You can also visit (by boat) the Fourni islands (just opposite Ikaria, you’ll find there very nice beaches, delicious fish and even lobsters) or (by flying dolphin) Patmos and pay a visit to the famous Monastery of the Apocalypses. 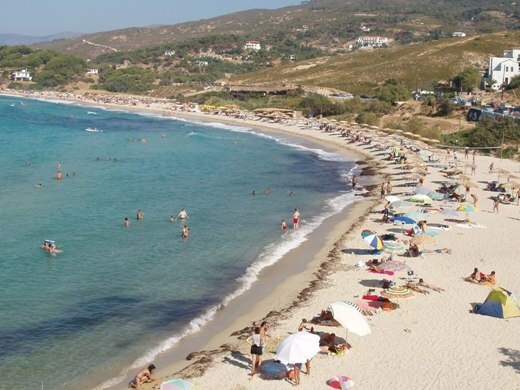 Ikaria is not a tourist island and there are very few large hotels and facilities. Therefore accommodation for participants in provided at small hotels, pensions and rent rooms. These are not luxurious 5 starts rooms but they are clean, with private bathroom (some of them also have a small kitchen) and, most of them with air-conditioning (although the pleasant wind -called “meltemia”- that blows at Ikaria during uly, often makes the use of air-conditioning obsolete). The rooms and pensions of the participants are located within Agios Kirykos and within Therma, the nearby village that hosts the famous Ikarian spas where, for the price of a few euros, you can enjoy a bath and a refreshing massage. Therma is 20 minutes from Agios Kirykos on foot or 5-6 minutes by bus (that is provided for free to the participants). Participation cost is always kept at reasonable prices and the organizers contribute to the costs for junior players, families and teams. Moreover, Ikaria is generally a cheap place to live and you can enjoy your vacation without spending too much money. In general the festival is an important cultural, athletic but also financial event for Agios Kirykos, since for more than 10 days, all pensions and restaurants are full with chessplayers and this is essential for the local economy. That is also the reason why the municipality of Agios Kirykos strongly support the event. This year, Ikaros International Chess Tournament becomes 35 years old and invites all chessplayers to visit Ikaria! Ikaros 2012 (5th till 17th of July) includes the traditional open international tournament “Open Aegean Championship 2012″ (7th till 15th of July) as well as plenty of other side events such as junior, Ladies, Veteran, blitz, rapid and simultaneous exhibition events, blindfold chess, problem solving, chess lectures and many others. We are looking forward to meeting you all at Ikaria this summer!